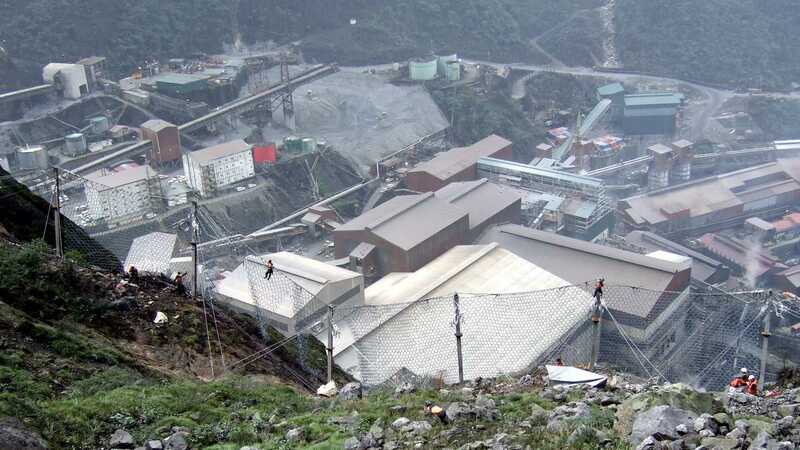 Providing turn-key solutions to the mining and resources sector, Geovert has attained an unrivalled reputation for delivering complex projects using pioneering construction techniques and sound engineering principals, to safely meet the needs of the increasingly demanding industry. 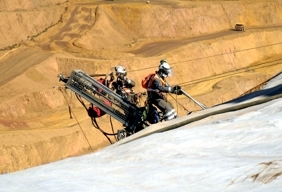 Geovert provides one of the most diverse ground support operations in the industry and works closely with owners and operators during detailed risk assessments, conceptual and feasibility studies through to providing practical design build solutions for the protection of the people, the in-ground assets, and the mine infrastructure. 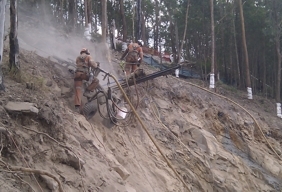 The company specialises in re-profiling and contouring to reduce natural risks and have successfully used alternatives to blasting in sensitive areas. 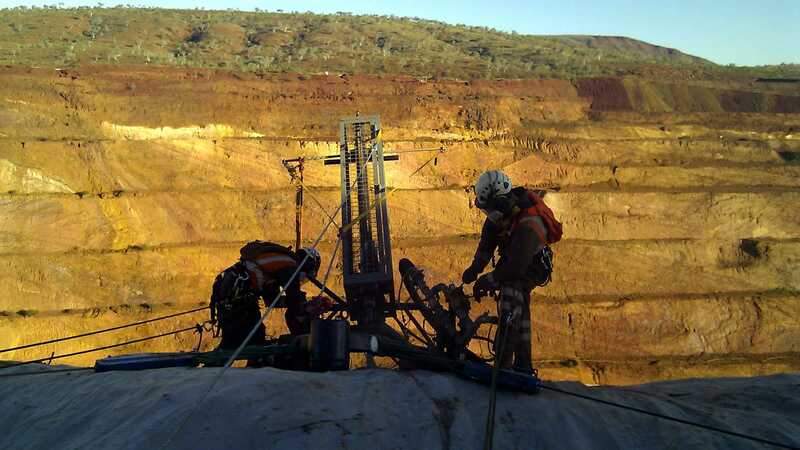 Our project teams combine geotechnical analysis and design, with technical drilling expertise, to produce optimal results. 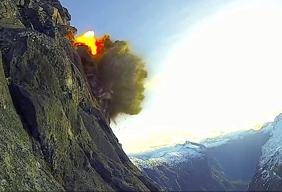 Geological defects, potential failure mechanisms and rock breakage mechanics are analysed to ensure blast accuracy. Geovert also provides low VOD ‘non explosive’ solutions suitable for residential or environmentally constrained sites - see PDF. Geovert leads from experience in this field, offering our clients the comfort of seamless, practical design-build solutions. 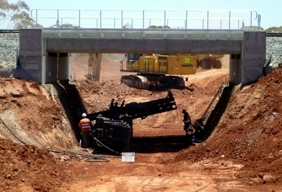 Our experience is comprehensive in every facet from design and project management, through to specialised construction equipment and techniques required for installation. 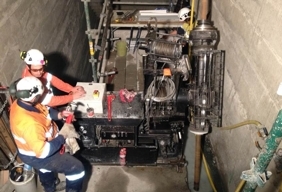 We have installed a variety of certified protection systems ranging from 100kJ to 8000kJ across a variety of sites protecting dam infrastructure, transport corridors, residential and commercial buildings, and in open pit mines. 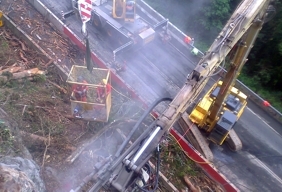 Many of the sites have required a combination of technical access including helicopters, cranes, EWP’s and roped access for construction and installation. 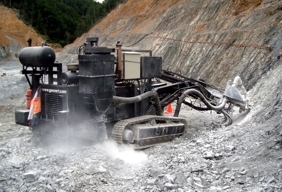 Geovert provides a variety of ground support techniques during the civil construction of infrastructure development and into operating mines to improve safety or as part of the mining process. 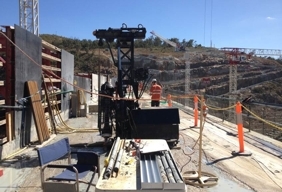 This includes the micropiling, retentions structures and ground improvement for development sites, to scaling highwalls, prism and instrumentation installation, cable bolting, rockfall mesh, rockfall barriers and blasting. The control of ground water can generally be classified into two categories; groundwater removal and ground water exclusion. We regularly install bored drains, which work under gravity to lower the ground water levels reducing the build up of porewater pressure. 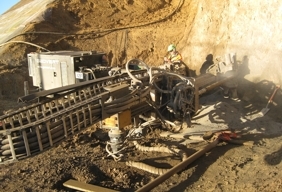 Geovert has capacity to install drains several hundred meters deep into rock with powerful drilling plant. 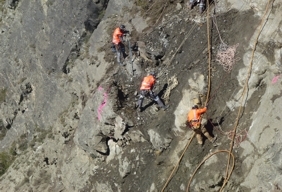 The stabilisation of rock faces, cuttings and slopes utilises a wide variety of techniques such as the application of rock bolts or dowels. 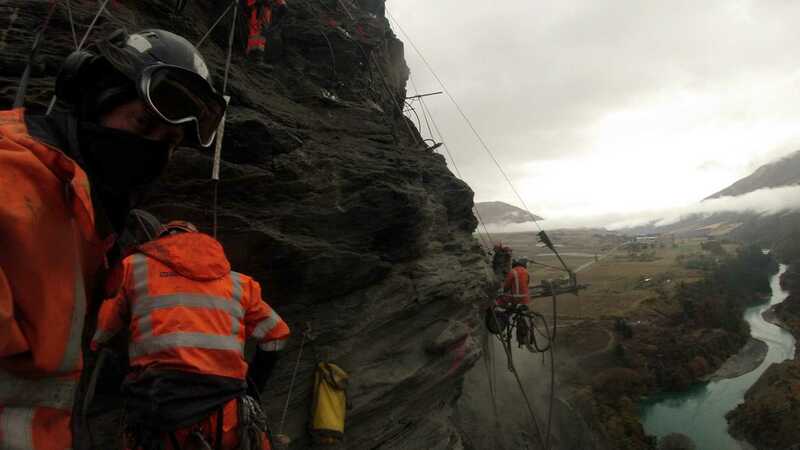 To ensure a practical design and ongoing safety of these slopes and cuttings, a sound knowledge of geological structure, rock mechanics and hydro geology must be applied when selecting the best solution. 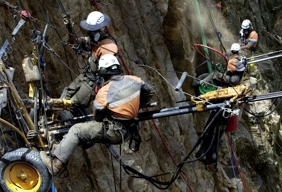 Rock bolts are used to pin the fractured rock, wedge failures or exposed cuttings, preventing toppling and rotational failure and sliding, buckling and bursting when underground. 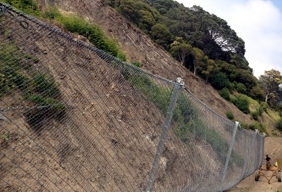 When it’s not an economical or practical solution to install rockfall barriers or active anchored slope stabilisation mesh systems, passive protections systems such as mesh drapes are commonly used in conjunctions with scaling. 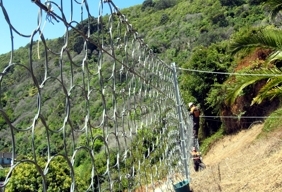 The installation of the wire netting, which is anchored at the top, then rolled over slopes is installed rapidly over large areas to mitigate the effects of the trajectory of small bouncing debris. 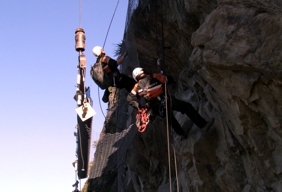 For drapes to be effective, they are required to have good permanent anchor points at the top to ensure they are not ‘ripped out’ when force is applied to the netting down slope from slides or rockfall, a common problem with many installations. 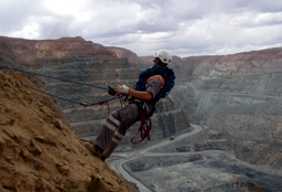 The purposes of a geotechnical investigation are to understand and interpret the geologic conditions of a site. 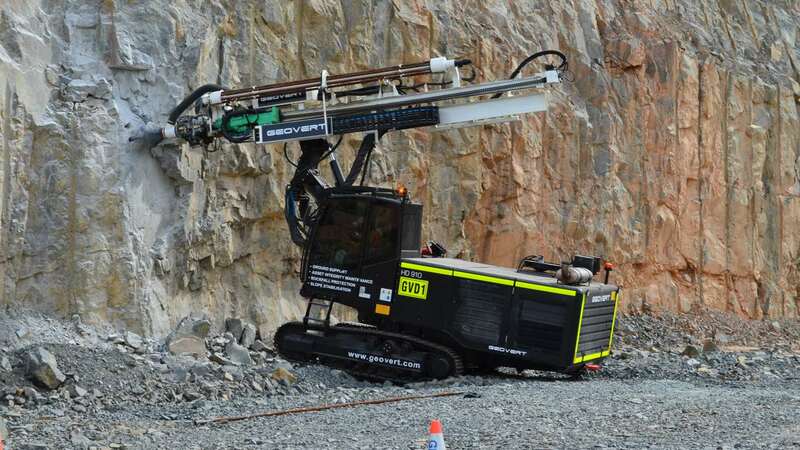 At Geovert we have a selection of equipment suitable for restricted and remote access investigation drilling. 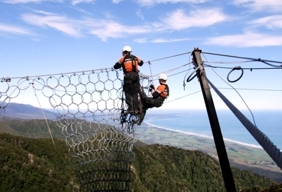 We have experience installing instrumentation such as extensometers, prisms and TDR’s high up rock faces to piezometers and inclinometers for monitoring works. 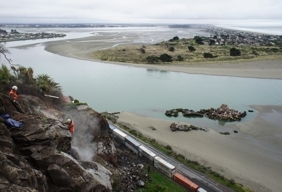 For emergencies caused by a natural hazard; such as slope failure or rockfall with access inhibited or closed to certain infrastructure, mine sites, roads or the rail network, Geovert have the ability to respond immediately. 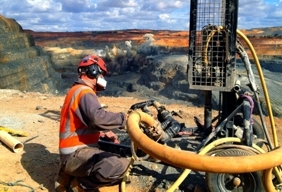 With multi-disciplined crews throughout Australasia we mobilise rapidly to make safe until permanent remediation can be implemented. 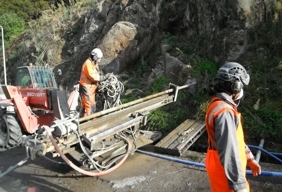 This may involve a selection of roped access hand scaling, mechanical scaling or blasting techniques so that further geotechnical inspections can be completed safely.